Heat oven to 375°F. 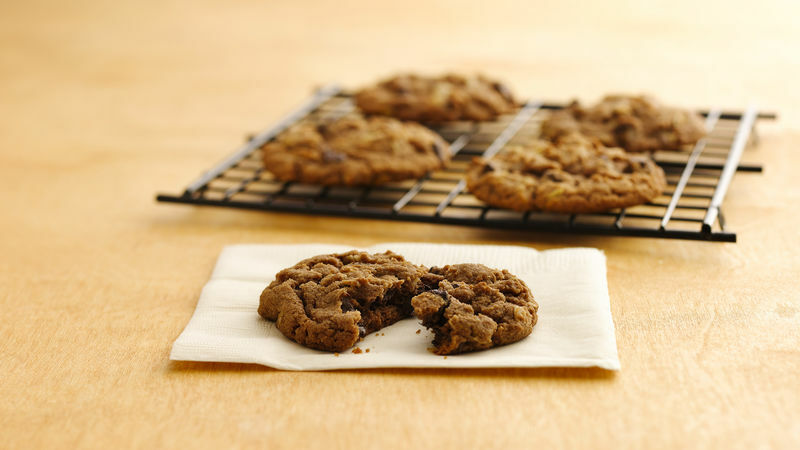 Line cookie sheets with cooking parchment paper or spray with Crisco® Original No-Stick Cooking Spray. In large bowl, beat butter and sugars with electric mixer on medium speed until light and fluffy. Beat in eggs and vanilla. On low speed, beat in hazelnut spread, peanut butter and dry cocoa mix until well blended. Stir in flour, oats, salt and baking soda until well blended. Stir in chocolate chips. Drop dough by rounded tablespoonfuls 2 inches apart onto cookie sheets. Bake 9 to 12 minutes or until edges are set. Cool 3 minutes; remove from cookie sheets to cooling racks. Store tightly covered.